Hello Friends Annie here with two quick cards for you. They came together really quickly. I am using the Hero Arts Spooky Labels – Halloween Digital Kit . I started by downloading and sizing the Hero Arts Spooky Labels to the size I needed for my cards. Next, I printed them onto Orange Cardstock. Card #1 -I trimmed the banner label and ink the edges with Hero Arts Black Ink. Then, I trimmed the Trick or Treat Sentiment & the little bat also inking the edges. Next, I trimmed my card panel from green cardstock adhered it to my black cardbase. Then, I punched a small circle at the top of the banner label and tied some black & white Baker’s Twine through it. Next, I trimmed the purple cardstock just a hair smaller than the inner part of the banner label. adhered it to the banner label – then adhered the sentiment with foam adhesive on top of the purple cardstock. I added some foam adhesive to the top and regular adhesive to the rest of the of the banner label place it onto the cardbase. Now, for some finishing touches – I adhered the little bat to the banner centered at the bottom. I popped up his wings with foam adhesive for some added interest. I then place 3 enamel dots in an angle on the corners of the card. Card #2 – I trimmed the Boo from the printed sheet. I matted it onto the holographic paper. set it aside. Next, I trimmed a card front panel from the Purple cardstock and stamped the triangles and circles onto the panel with Wilted Violet Distress ink. Then, I adhered the purple panel onto some of the holographic orange paper. I then adhered the card panel onto the dark gray cardbase. Next, Die cut the word Happy from green cardstock 3x – next I stacked and adhered each layer so I ended up with a nice thick die cut word. Then, I stamped the -for you- onto a small pieces of lime-green cardstock – I trimmed it down and fishtailed both ends. 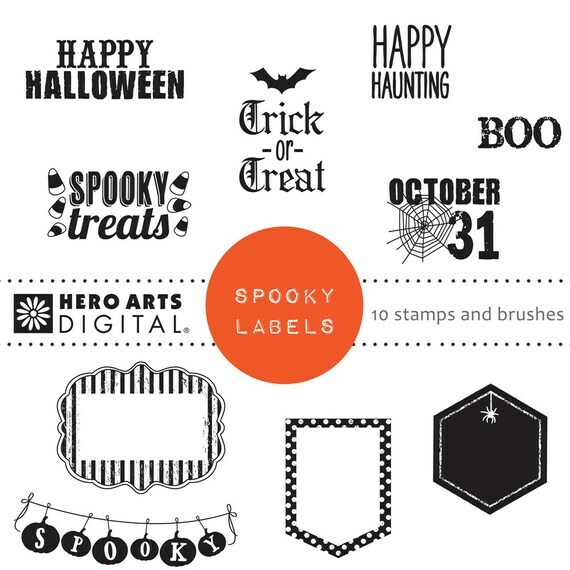 I hope you give the Hero Arts Spooky Labels – Halloween Digital Kit . a try. It’s perfect for your quick Halloween cards. Please join us in this month’s “Frightfully Fun” challenge. As you know, we’ve changed our rules a bit and participants are no longer required to use Hero Arts products to enter our challenges. Each month we feature a ‘Digi of the Month’ which will be the prize offered to our randomly-chosen challenge winner from our Hero Arts store. Our current monthly challenge can always be found in the menu bar, and runs from the 1st to last day of the month. So fun, and the “happy boo for you’ so clever!! Excellent job and so creative. You are the master of creativity. Nicely done Annie! Love the interesting colors you used on your cards.